Rev. Tracey Blackman, speaking on “webinar video” (below) about the Gamaliel Foundations’s activism in Ferguson,[i] said that the Gamaliel-involved clergy must be “protectors of the narrative” and that they would be the ones to tell what really happened in Ferguson. In an era when media regularly “shape” the news for their own political ends, we understand what Rev. Blackman means by a “narrative.” The facts – that a young Missouri man, Michael Brown, was shot and killed by a policeman or that “communities of color” suffer disenfranchizement, disproportionate unemployment, and substandard education – are rarely presented in unadorned form. They are “embroidered” with unsubstantiated claims. One hears from one source that “Michael Brown was weaponless and unresisting” and from another that “Michael Brown had gunpowder on his hands.” Eyewitnesses say he was shot despite having his hands in the air; eyewitness say he didn’t have his hands in the air. Gamaliel wants to be sure that its “narrative” is the one broadcast across the country – that Michael Brown was a victim of police brutality and a racist system that targets young black men. This narrative counters another that would dismiss Michael Brown’s neighborhood as violent, crime-riddled, disrespectful of the law, and trying to blame the police for its problems. In between these two “narratives” sits a frightened, long-suffering community with far more of its share of problems than anyone deserves. Then, on Monday, Gamaliel called for clergy-led civil disobedience, with the plan being that many would go to jail, presumably gaining national media coverage by the act. Debtor prison? Boost city coffers? Really? Is this a “narrative” that best serves a beleagured people or is there, perhaps, still another, yet to be explored? Is there “good news” that clergy might carry, petitioning God’s will rather than Gamaliel’s? Are there ways to help hurting people that don’t perpetuate structures of injustice? If Gamaliel were a purely secular political organization, such questions would make no sense. As an organization with clergy among its leadership and that is funded by religious institutions,[vi] these questions are not merely reasonable – they are long overdue. 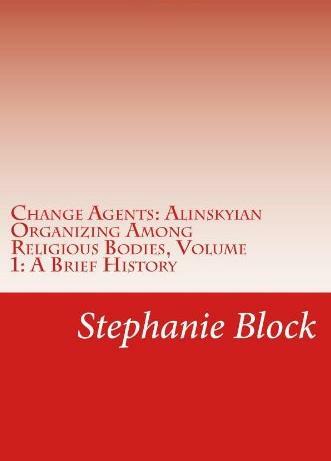 Stephanie Block also edits Los Pequenos – a newspaper based in New Mexico – and is the author of the four-volume ‘Change Agents: Alinskyian Organizing Among Religious Bodies’, which is available at Amazon. [i] Gamaliel webinar video, ““MCU and Gamaliel’s October Push for Ferguson” October 7, 2014: http://www.youtube.com/watch?v=OgGE3gfJwcM&feature=youtu.be (accessed 10-15-14). Link to the video appeared on the Gamaliel Foundation homepage: http://www.gamaliel.org (also accessed 10-15-14). [ii] Laura Barrett, “A Generational Divide Between Organizers in Ferguson,” Rooflines (Shelterforce blog), 10-15-14. [v] Laura Barrett, “A Generational Divide Between Organizers in Ferguson,” Rooflines (Shelterforce blog), 10-15-14. [vi] To give an example, the Catholic Campaign for Human Development has given MCU the following national grants: $25,000 (2007-2008); $30,000 (2008-2009); $30,000 (2009-2010); $40,000 (2010-2011); $45,000 (2011-2012); $55,000 (2012-2013). 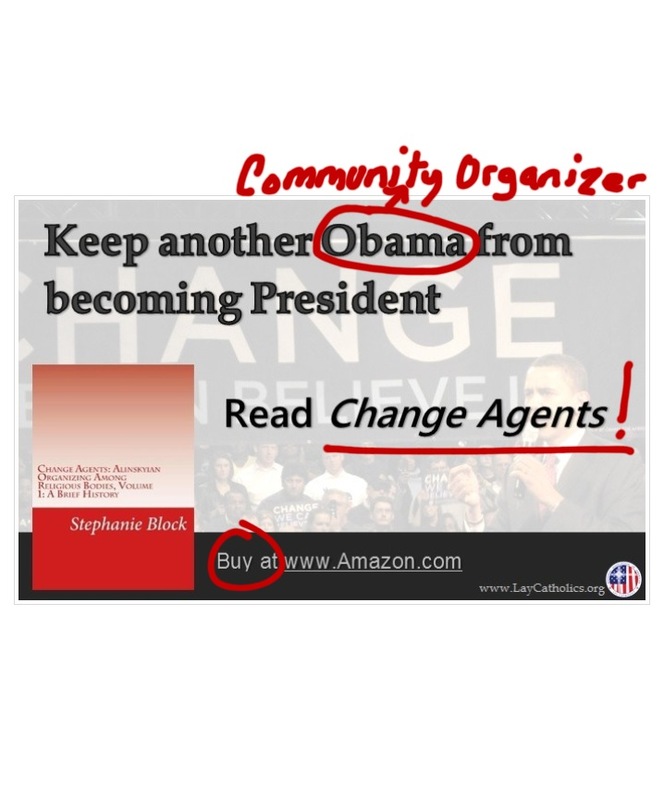 President Obama as Barack the Organizer exposes the purely partisan nature of Alinskyian political organizing. It’s the Chicago Way. 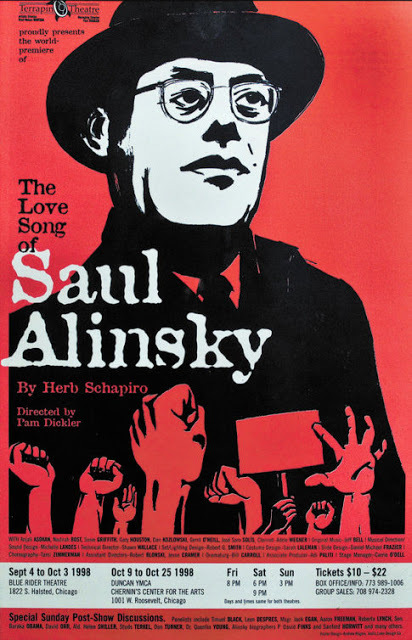 One of the most frustrating experiences a congregant can face is watching his faith community join an Alinskyian community organization (also referred to as a socialist community organization by “Lay Catholics”.) Sooner or later, he will approach the pastor, complaining that the organization is “just another political” group. The pastor patronizingly retorts that it isn’t. …(as has the president’s wife, Michelle[iii]) for the initiative. Carson invites folks – yes, it’s very folksy – to join the group and form a lobbying machine for Obama’s agenda, which is currently working on passage of comprehensive immigration reform legislation, gun control legislation, and a progressive budget. 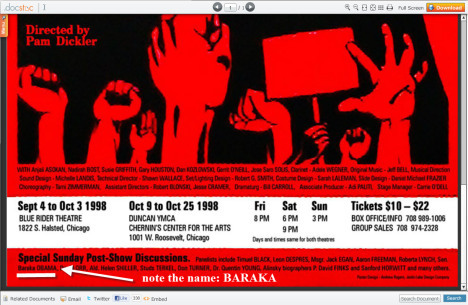 It links to BarackObama.com, so there’s no question who’s the lead organizer. 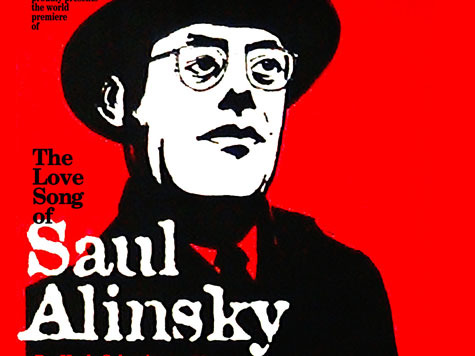 Are the Alinskyian community organizing networks involved in Organizing for Action? As it would have been awkward for non-profits to have been directly involved with the Obama reelection campaign, it is not surprising that Organizing for Action, rising from that campaign, is not immediately associated with them. However, there are hints that a marriage has been proposed and is forthcoming. There has also been reportage about the convening of various religious left coalitions recently, specifically around the three issues that Organizing for Action has chosen for its opening salvos. The Interfaith Immigration Coalition, which is promoted by Faith in Public Life, includes Sojourners, many of the prominent, dissident Catholic groups (NETWORK, Pax Christi, Leadership Conference of Women Religious, etc. ), national denominational entities with strong Alinskyian organizing ties, the PICO National Network and Interfaith Worker Justice. Of course, this is nothing new. Throughout the years, Interfaith Worker Justice has coordinated vigils, rallies, and “pulpit swaps” for comprehensive immigration reform. The Southwest Industrial Areas Foundation has coordinated “clergy preaching for the pulpit” on the topic. Gamaliel has run National Prayer Vigil Campaigns and a Civil Rights of Immigrants Campaign. The White House has held gatherings of “faith leaders,” hoping to craft coordinated messages of “religious” support for its efforts. These groups have been working together for a long time. Congressman Paul Ryan’s (R-Wisc.) 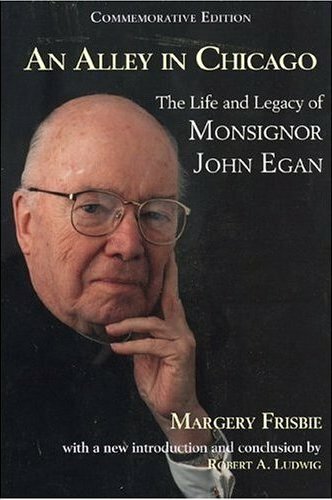 proposal for a federal budget based on his understanding of Catholic social principles such as “subsidiarity” and fiscal discipline became a focal point against which the Alinskyian organizing networks and their allies enthusiastically rallied. [iv] Ana Garcia-Ashley, “Show Me What Democracy Looks Like,: Huffington Post, 11-7-12. [v] Mark Tooley, “Religious Left Wants Control of More than Guns,” Front Page Magazine, 1-18-13. [vii] Alec Harris and The Rev. David Brawley, “Gun control without waiting for Congress Wield the buying power of police departments and the military,” New York Daily News, 2-7-13. [viii] Faith in Public Life Press Release, “Faith Community to Congress: ‘It Doesn’t Take a Miracle to Make a Moral Budget’,” 3-18-13. [ix] Allison Kilkenny, “The Resistance Continues as Citizens Fight Budget Cuts,” The Nation, 6-26-12.